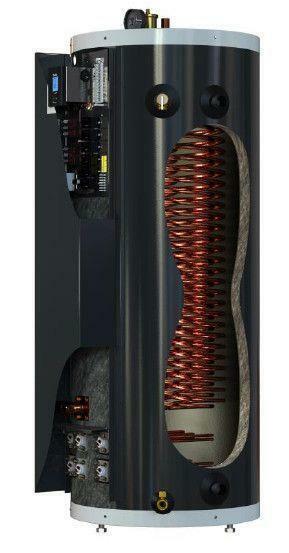 The perfect combination for any heat pump or geothermal hydronic heating system. 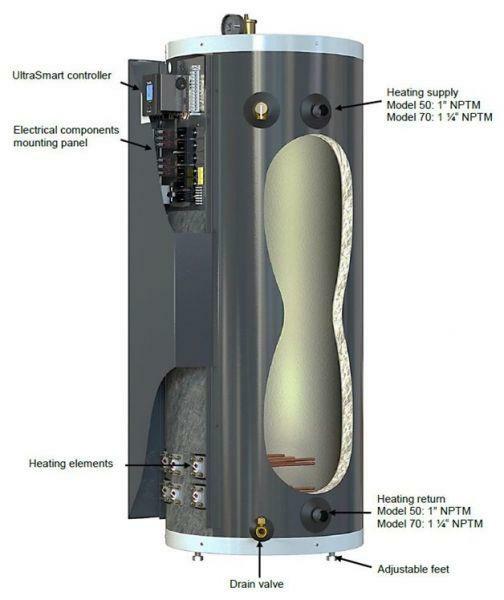 Eco Ultra is the only buffer storage tank that is also a fully integrated boiler. This tank provides home owners the comfort they need to ensure their heating demands are met 100% of the time in any weather condition. In temperatures below -30 C (-20F) the air source heat pump loses its heating power. By pairing the cold weather heat pump with the Eco Ultra you can ensure you will always have the energy available in any temperature. Available from 4.5 Kw to 29 Kw size ranges. By combining a buffer tank with a high efficiency boiler you get great savings as well as space saving and installation costs are reduced. Now you can enjoy all the savings your Arctic Heat Pump provides while having the assurance that your heating system will always be ready in any weather conditions. 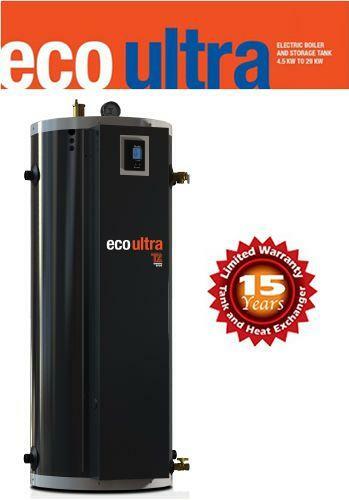 The Eco ULTRA can optionally be included with a high efficiency internal heat exchanger that can be integrated with solar collectors to provide even more free energy or integrated with the homes hot water system to provide hot water taking advantage to the heat pumps energy savings. A buffer tank is needed with any hydronic heat pump such as our air source heat pumps as well as a geothermal hydronic heat pump. It provides the same function as a battery does in a Solar Voltaic System. By storing the thermal energy you allow the energy to be used when a demand is needed. Should the demand exceed the capacity of the heat pump then the heat pump sends a signal to the Eco ULTRA to provide back up. A buffer tank also allows the heat pump to turn on and run for longer periods as there is more mass to heat. 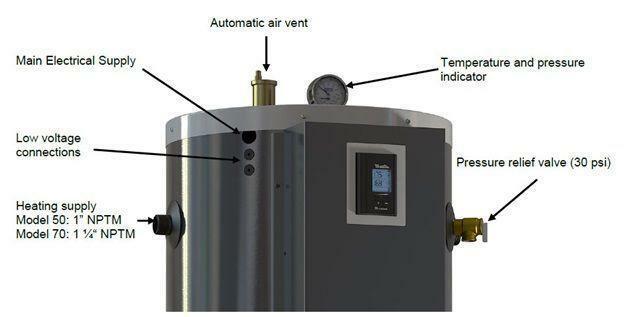 This reduces the short cycling that can harm typical heat pumps. The Eco ULTRA is available in a 50 gallon or 70 gallon options, and comes standard with an industry leading 15 year tank warranty. Allows the system to use just the right amount of energy when needed. It has an exterior sensor that knows what adjustments will be needed internally as the temperature drops. By programming the type of hydronic heat (radiant floor with concrete, radiant floor with wood joist, cast iron radiators, or base board hydronic heaters) the system will automatically keep the heating fluid at the optimum temperature. 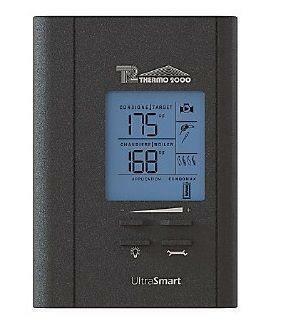 While the Eco Ultra may be equipped to provide up to 29 Kw of back up energy, the UltraSmartTM Controller only provides the minimum to keep the system optimal. In most cases the system will need no back up heat, however as the exterior temperature declines the controller will start to sequence heating elements to ensure the demand is always fully met. In this way the heat pump’s cheaper energy is fully utilized first before any secondary heating is applied. Full Hydronic System - not only is the Eco Ultra a boiler system but it also manages your entire hydronic heating system. With its integrated pump control, the controller will maintain the pump operations including purge delay and other standard hydronic needs such automatic seasonal start/stop up based on outdoor temperatures. Also included is a diverter valve control feature to easily allow you to switch your heat pump to cooling mode in the summer season. With the optional copper heating coil you can also utilize the EcoUltra as a on demand hot water tank or a pre heat tank allowing you to produce domestic hot water at ¼ of the energy cost of a traditional electric hot water tank. 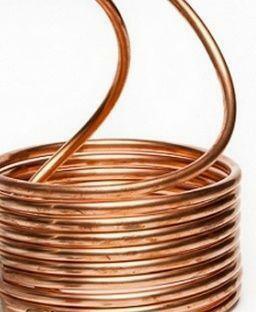 The 160 foot copper coil has a heat exchanger capacity of 90% allowing instantaneous hot water. By using the EcoUlta tank you can achieve far greater cost savings for your whole house. And with optional direct solar ports you can also supplement the tank heating with solar thermal further reducing energy cost. With 4 outputs to choose you can be assured of a clean looking installation. The large port size (1” or 1 ¼”) ensure the flow rates are not reduced minimizing the pump head requirements. 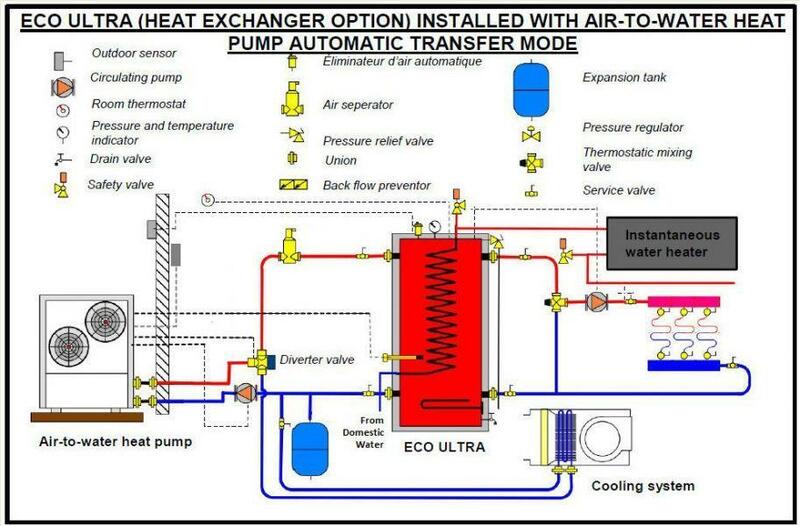 With the internal cooper heat exchanger a customer can either integrate their heat pump system with solar thermal or they can provide hot water heat for domestic water use.